In southern Germany, the Karbatsche is used for traditional whipcracking in the carnival season (from January 6th at noontime until Fastnacht, seven weeks before Easter). 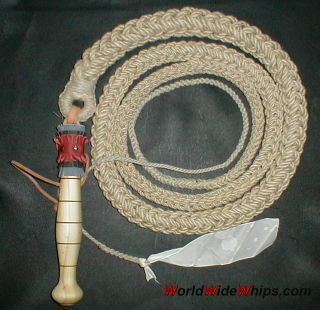 The whip´s noise is intended to frighten evil spirits. This whip is braided hemp rope, in the past the Karbatsche was made of leather. Note the broad piece of fabric which is the popper (for safety reasons), no fall or slapper. Handmade by the German rope manufacturer Bernhard Muffler.